Mir Taqi Mir dissociated the values of Muslim society with the collective identity of that society, and hence the values survived even when that society was no more. The Mughal society at the time of Mirza Asadullah Khan Ghalib (1797-1869) was different from that of Mir Taqi Mir. It was no longer a candidate to power. You can listen to this ghazal of Ghalib online at YouTube, read his poetry at Allama Iqbal Urdu Cyber Library or find out more about him at Wikipedia. 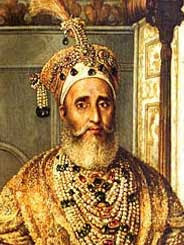 Next Installment: Bahadur Shah Zafar, a Constitutional Monarch?